45 Blue Largo - Westbrook Beach Accommodation. Blue Largo is situated on Westbrook Beach, which is a beautiful stretch of coastline situated on the Dolphin Coast of KwaZulu-Natal. These unspoilt beaches are ideal for sun loving enthusiasts who enjoy what the beaches have to offer. Activities such as crayfishing, snorkeling, shore angling, oyster and mussel collecting or simply watching your kids play in the rock pools is just part of the experience. Westbrook Beach is situated between Umdloti and Ballito. It is a stone's throw from the prestigious Zimbali Estate. A short drive south (approx. 15min.) will take you to the Umhlanga Village or to the amazing Gateway Entertainment Centre. Beautiful Ballito is only 8 min north of Westbrook. This 2 bedroom 2 bathroom upmarket apartment is modern and is totally equipped for self catering holidays. It has direct access to the beach and has stunning panoramic seaviews from the lounge and bedroom. The spacious verandah allows you the opportunity to sit back and enjoy the splendor of our beautiful coastline. 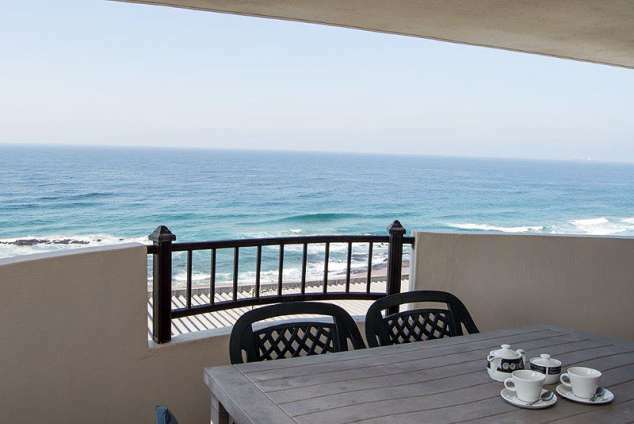 Sundowners and dolphin viewing are synonymous with this apartment as well as the therapeutic sound of the waves as you drift off to sleep at night. It has DStv, ducted airconditioning and a beautiful granite kitchen. There are braai areas and a pool for you to enjoy as well. A 2min. walk will lead you to the ever popular Beach Bistro restaurant. The stunning Prince's Grant). Microlite flights, deep sea fishing or visits to a crocodile farm are also easily accessible. If you are wanting quiet unspoilt beaches and yet want to be close enough to enjoy the towns of Umhlanga and Ballito, then Westbrook Beach is ideal. With all the new development taking place it is becoming the new jewel on the dolphin coast. 75420 page views since 30 Aug, 2006.